During a typical hair removal treatment, blood vessels and melanin in the follicle of the hair absorb light from the Apogee 40. The light heats the follicle, damaging it. Successive treatments render the follicle too impaired to produce new hair. The light that damages the hair follicle, however, does not damage the surrounding tissue. Instead, the Apogee 40 treatments leave smooth, clear, healthy skin. Treatments can target virtually any area of the body, on men as well as women, and most patients can expect permanent hair loss after a full course of treatments administered with the Apogee 40. With over 14 devices on the market, Cynosure has one of the most comprehensive portfolios of aesthetic medical lasers in the world. The company has enjoyed its lofty market position for over 20 years, and it owns 37 U.S. patents. The Apogee 40 has received U.S. Food and Drug Administration clearance to be marketed as a treatment for leg vein and hair removal. 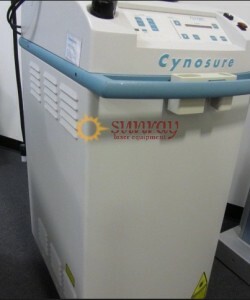 SunrayLaser.com is always glad to count equipment from Cynosure among our inventory of quality aesthetic medical lasers. Certified laser technicians have skillfully reconditioned every previously owned Cynosure Apogee 40 in our extensive inventory. Your unit will conform to the manufacturer’s standards for operation in addition to all applicable international safety specifications. Our experienced aesthetic device consultants are ready to discuss the many benefits of owning a refurbished, surprisingly affordable Cynosure Apogee 40. Please take a few seconds to fill your data in the form below. One of our friendly staff will be in touch shortly.